Although Foursquare is not doing as well as was initially projected, some guests are still checking in on the location-based social network. Yes, Foursquare does not have the user base of Facebook, but if your guests are there, you should be too. Enter Foursquare for Business, a mobile app for iOS and Android. It is designed to supplement Foursquare and ease the business page management. The process is good for business owners on-the-go. The first step in gaining access to Foursquare for Business is to claim your business. Hopefully, this was done long ago. Check activity – This shows you any recent activity happening on your business page. This includes recent visitor check-ins, tips, photos, likes, etc. The tab is valuable & straightforward. It gives you a quick up-to-the-minute snapshot of activity. Manage specials – From this tab, you can turn specials on or off, and manage various other aspects. View customer stats – The stats available are not detailed, but they can tell you enough to get an idea of the demographics of your media-savvy social customers. Available to you currently on the Stats tab is a summary of your business’ page, such as how many total check-ins there are. There is also a list of your recent top customers, and how many times each has checked in. 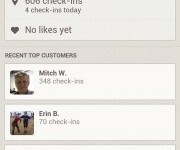 Post updates – This is one of the best features of Foursquare for Business. Business owners can share updates and photos with their customers. If done on the business’ Foursquare page, they can share them on Twitter and Facebook, too. How can hoteliers use Foursquare for Business? Beyond the ease in the way you manage your hotel’s online reputation, you can do a lot more to bring in guests to your property. The way it recommends establishments to nearby users, there is lots of opportunity to draw in passersby. You could post a photo of your restaurant’s latest specialty, or your fancy new lobby artwork. Foursquare for Business may not be a groundbreaking development, but it is still a valuable addition. It, without a doubt, opens up more potential for interaction between brands and users. Get started updating your hotel’s Foursquare page today!